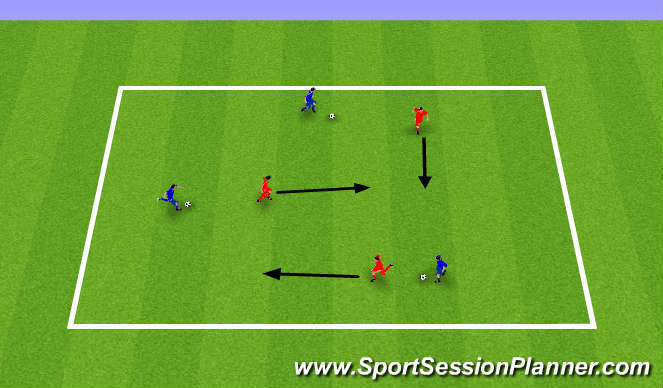 Out- Players dribble to outside of grid and dribble around it. 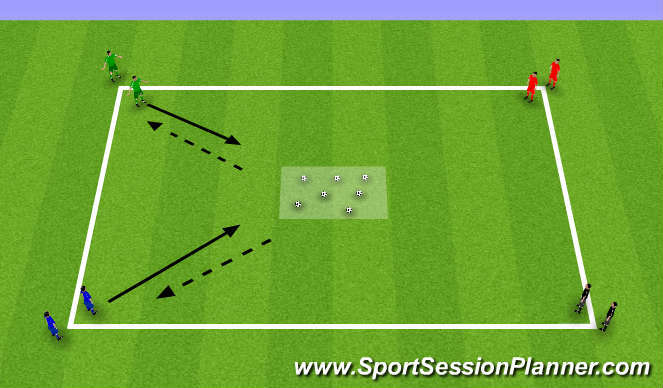 Description: Place players in pairs, one player with ball and one without. Start players back to back. Upon the command go, the player without the ball tries to lose their teammate who is dribbling after them. When the coach shouts &apos;FREEZE&apos; players stop. Player without ball stands with legs open facing teammate. Teammate tries to pass through teammates legs. 10 points for getting it through and 5 if they hit the teammates leg and doesn&apos;t go through. Losing player does punishment. Description: Split players into 4 teams. Players race to try and retrieve soccer balls. Once they retrieve they have to pass ball back to team. Once all the soccer balls have been retrieved from the middle they can steal soccer balls from other teams. Players must pass the ball back.